Kolkata: East Bengal received a severe jolt when their striker Jobby Justin was on Tuesday handed interim suspension along with Aizawl FC's Kareem Omolaja for their ugly spats during Monday's I-League clash. File image of Jobby Justin. The Red-and-Gold brigade's title aspiration virtually went up in smoke after their back-to-back draws against Churchill Brothers and Aizawl FC, which also concluded their home stretch. The interim suspension will last till 3 March when the AIFF disciplinary committee meets. East Bengal's top-scorer will miss at least two matches – against Real Kashmir and Minerva Punjab. 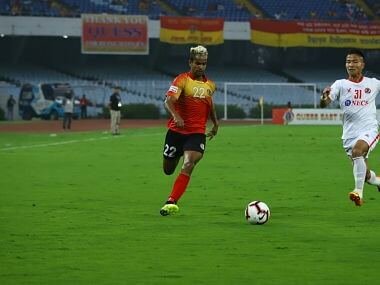 Jobby was found spitting on Kareem after an ugly second-half tackle, while the Nigerian was involved in a fight with East Bengal top defender Borja Gomez. East Bengal are seven points behind leaders Chennai City FC with a match in hand.